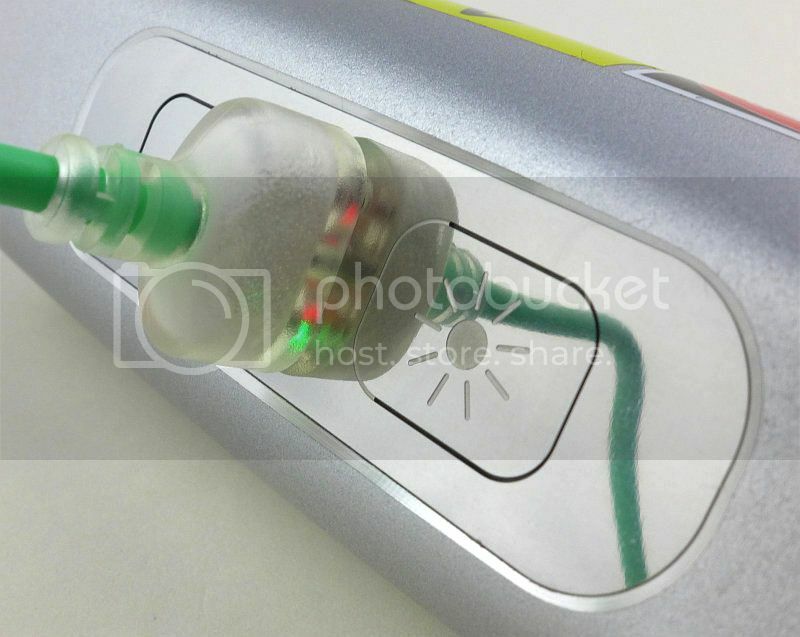 The test sample/s featured in this article have been provided for technical testing and review by the manufacturer. Test samples are retained by the reviewer following publication of the completed review for the purposes of long term testing and product comparisons. All output figures and test results published in this review are the sole work of the reviewer, and are carried out independently and without bias. Test results are reported as found, with no embellishments or alteration. Though best endeavours are made to maintain the accuracy of test equipment, the accuracy of these results is not guaranteed and is subject to the test equipment functioning correctly. Following her inspired vision of improving cyclists’ safety, Emily Brooke, founder and CEO of BLAZE, created a unique bike light that (as well as a regular white light) also projects a laser image of a bike forward onto the road to warn other road users of the cyclist’s presence. 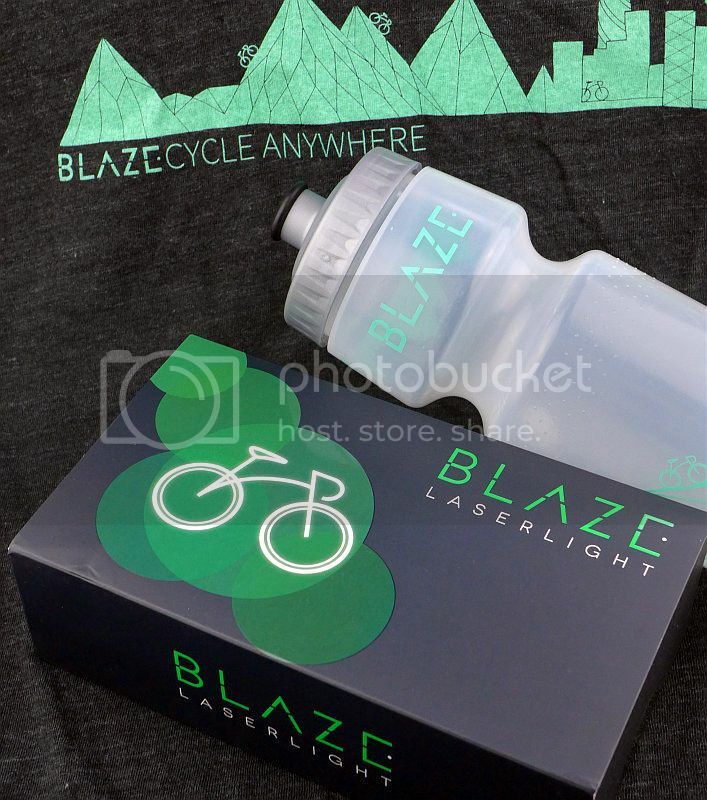 BLAZE also have other accessories like the T-shirt and BPA free water bottle shown here. Presentation packaging is as good as you might expect from high quality mobile phones. Removing the outer sleeve to get to the main box. No disappointments on opening the box. Taking off the upper tray shows the included accessories. 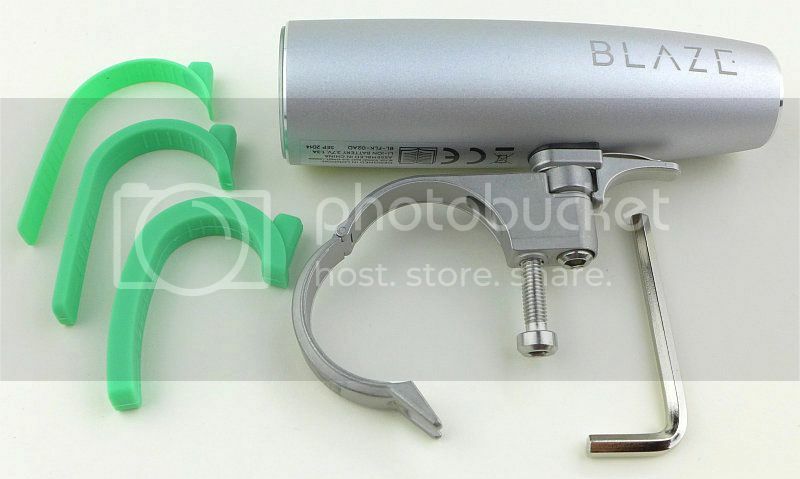 Included are the Laserlight unit, its handlebar mount, a total of three mounting rubber shims, an Allen key, USB charging cable and instructions. A closer look at the different thickness rubber shims for the mount. The Laserlight has an excellent all-metal quick release mount. Looking much closer, you can see not only the octagonal shape of the post, but the locator groove that means it will only fit together one way. Next to the socket you can also see the safety magnet which prevents the laser from being used without the Laserlight fitted to the mount. 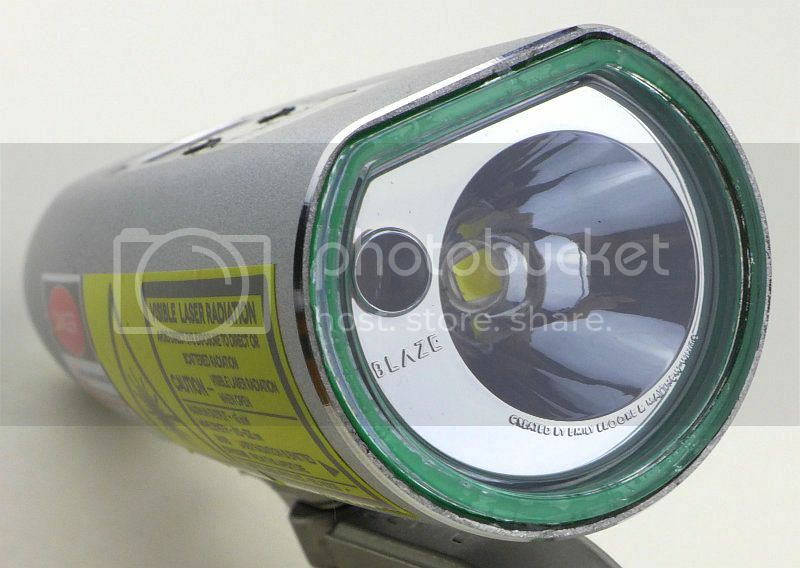 What can’t quite be seen from this angle is one of the details that shows the quality of this light. 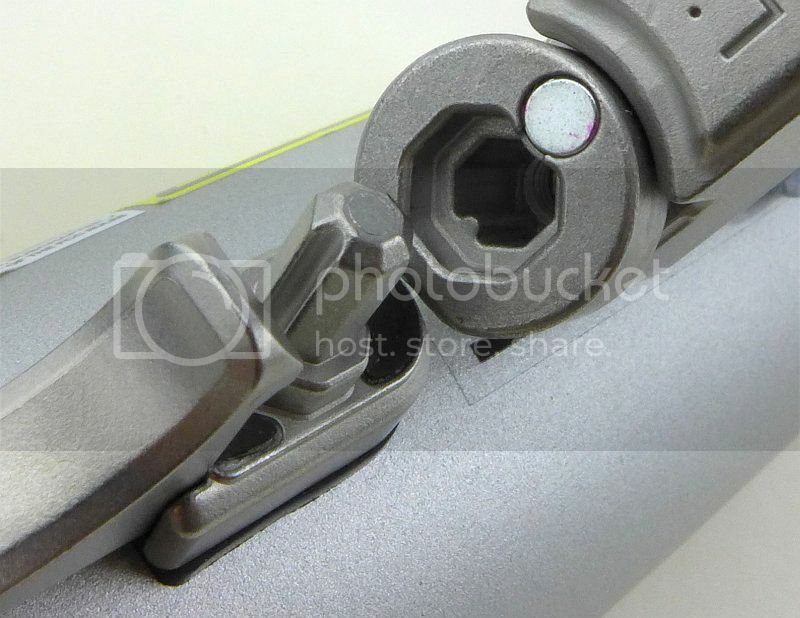 The yaw adjustment bolt fits into the bottom of the socket on the mount. This adjuster bolt has been drilled through to allow water to drain out of the socket. A small detail maybe, but one which could have easily been overlooked. 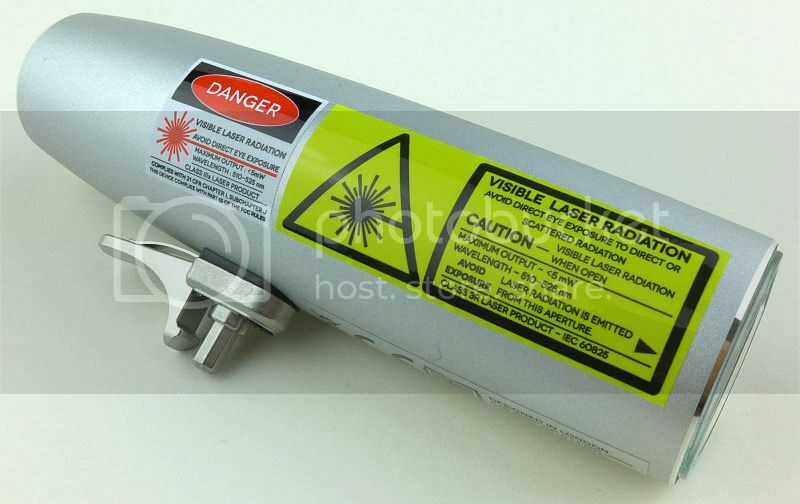 Emblazoned on the side of the Laserlight are the warning stickers for the laser output. 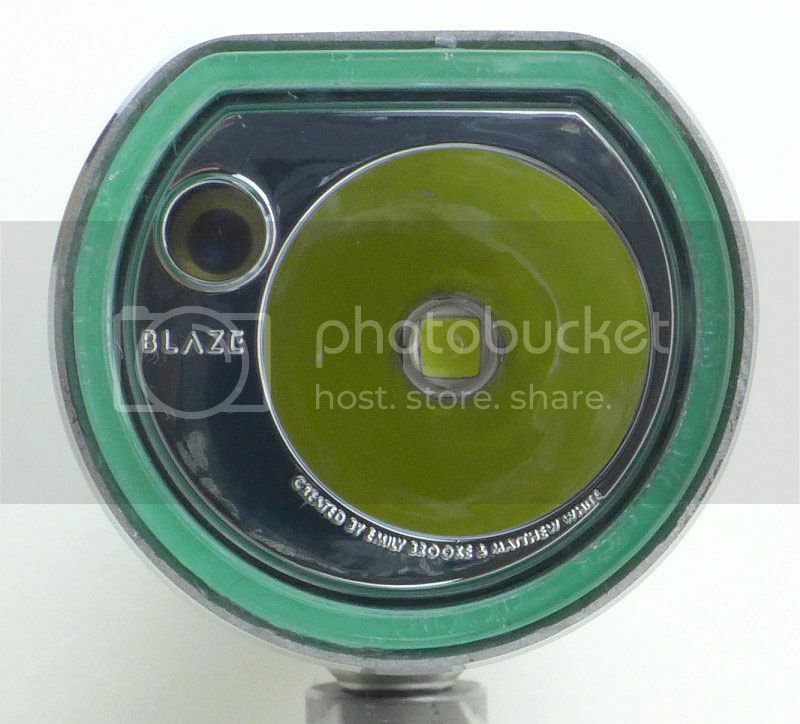 Even the mount is a work of art, with the BLAZE logo cast into the top of the mount. On the top of the Laserlight is the control panel with engraved labels on the two buttons. In the middle of the control panel are the charging contacts and the magnetic charging connector holds itself in place. Next to the main beam’s reflector is a hole through which the laser shines. Though not specified, the LED appears to be an XM-L2. 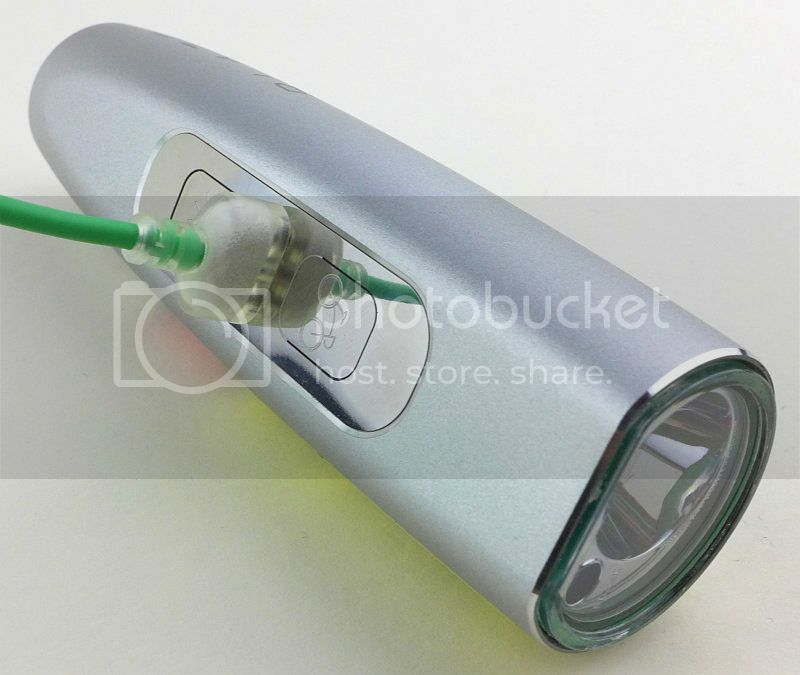 Underneath the connector, a green light is shown to indicate it is charging. While charging a red light is also shown to indicate the battery is not full, changing to blue when the battery is fully charged. A closer look at the charging cable and control panel. And the blue light to show it is fully charged. The indoor beamshot is intended to give an idea of the beam shape/quality rather than tint. 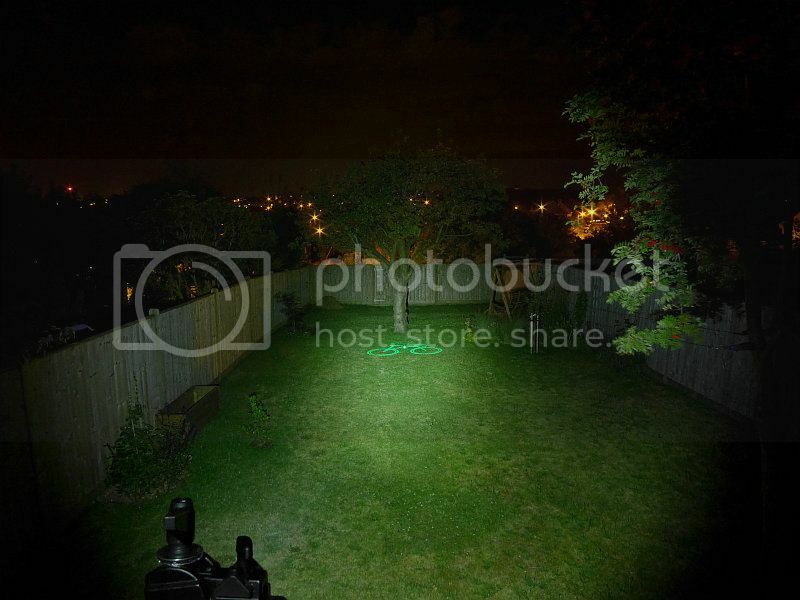 All beamshots are taken using daylight white balance. The woodwork (stairs and skirting) are painted Farrow & Ball "Off-White", and the walls are a light sandy colour called 'String' again by Farrow & Ball. I don't actually have a 'white wall' in the house to use for this, and the wife won't have one! Starting indoors, the main beam overpowers the laser (as you might expect). The main beam itself is a standard beam with smooth spill and hotspot. 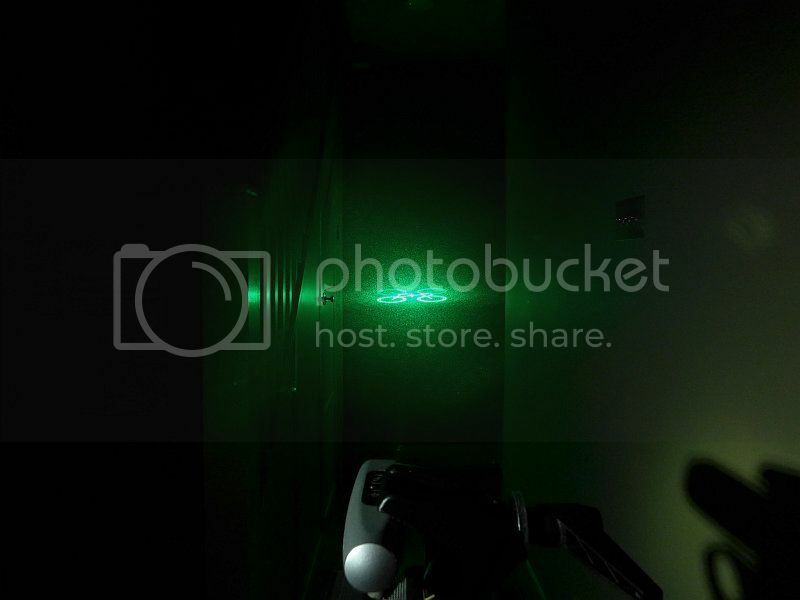 Switching off the main beam and increasing the exposure shows the image of the bike created by the diffraction grating. This is a much closer range than the laser image is intended to be viewed from, so it appears quite small. Outdoor the BLAZE laserlight’s trick is clearly evident. 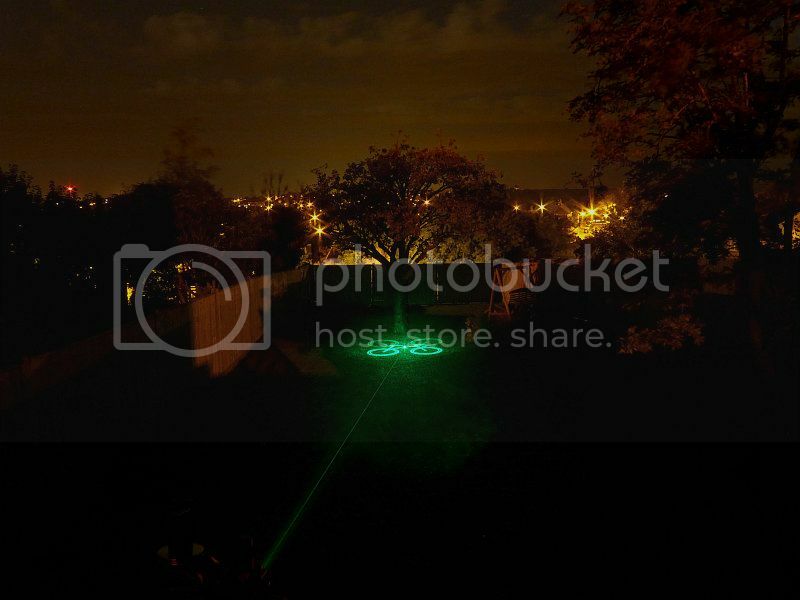 The main beam lighting up the area well enough and the laser image projected onto the ground. Switching off the main beam and increasing the exposure again gives a dramatic effect. You can see the characteristic mottle look of a laser diffraction grating image. Both main beam and laser can be operated independently using the twin button control panel. One button is marked with a ‘Sun’ symbol and the other with a ‘Bike’. The main beam has Flashing, Low and High modes, and the Laser has Flashing and Constant modes. As well as the twin button control panel, the mount also acts as part of the control system as only when fitted to the mount is the laser able to be activated. Another safety feature deactivates the laser after the Laserlight has been off for a few minutes. This means you have to positively intend to activate the laser, and it shouldn’t be turned on by accident. From OFF, press the ‘Sun’ once to enter Flashing, once more to switch to Low, again for High and once more to turn off. To switch OFF from any mode, press and hold the ‘Sun’ button for 2s. To activate the laser, first switch the main beam on to any mode. Then press the ‘Bike’ button to switch the laser onto Flashing mode. Press the ‘Bike’ button once more to make the laser Constant, and once more to turn it OFF. Within a couple of minutes of turning off the Laserlight’s laser, it is possible to switch the laser on without first turning on the main beam. 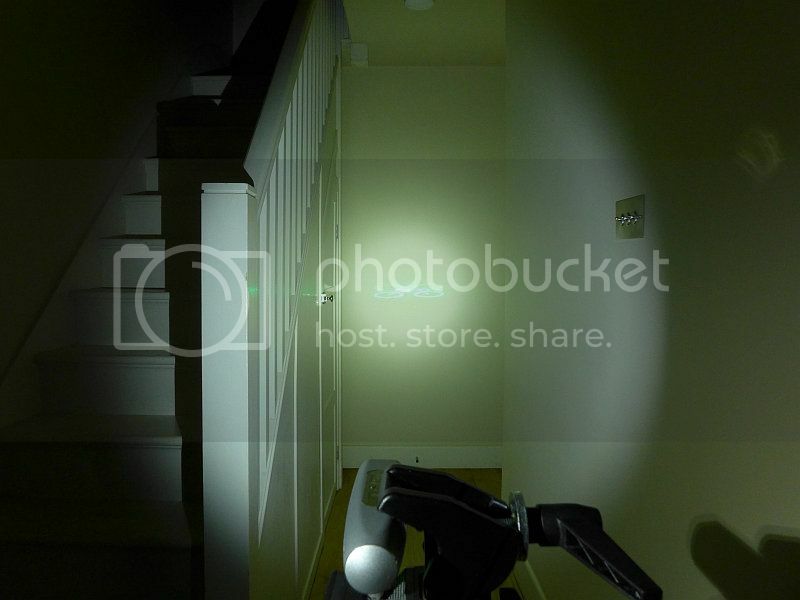 A lockout mode can be activated by pressing and holding both buttons at the same time. When entering lockout the main beam flashes twice. Unlocking is the same process. 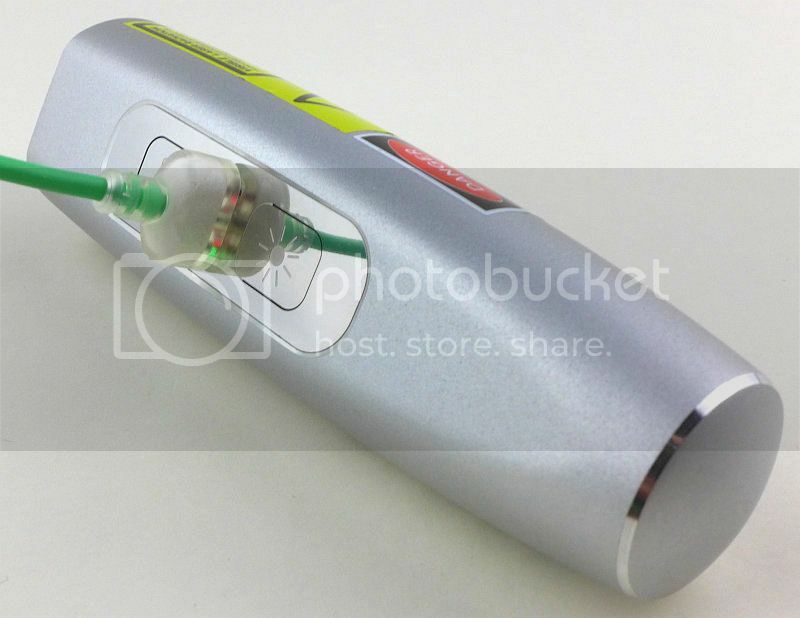 The Laserlight runs on a built-in 1300mAH li-ion battery. Peak Beam intensity measured 2000lx @1m giving a beam range of 89m. There is parasitic drain, but as a completely sealed unit I cannot measure it. Output is nicely regulated during the entire run. 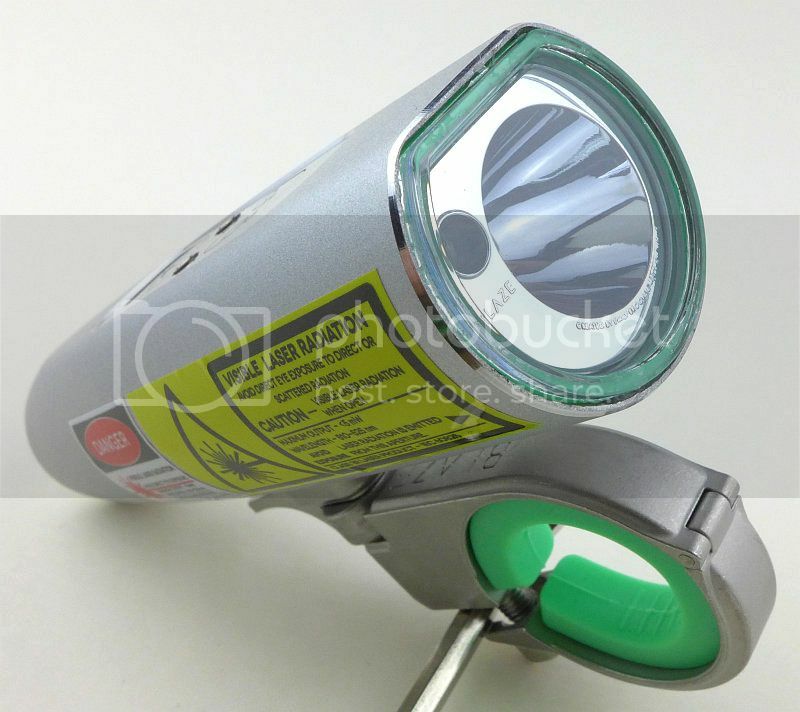 Once we reach ANSI cut-off, the Laserlight drops to a flashing mode, so does not cut out completely. This is a new section I am adding to mention any minor niggles I came across during testing, in case the information helps anyone else. As per the description of this section, this information is provided in case anyone else finds a similar 'issue' that might be fixed in the same way. Unfortunately due to a persistent shoulder injury, I have been prevented from testing the Laserlight as much as I would have liked before completing the review. This has also prevented me from getting some on-the-road/trail beamshots which I would normally include for a bike light review. As I’m not expected to be fit to ride again for several months I’m publishing what I have. Before the injury prevented it, I did get in several long rides with the Laserlight over varied terrain and both on and off road, so do have a good sense of its strengths and weaknesses. 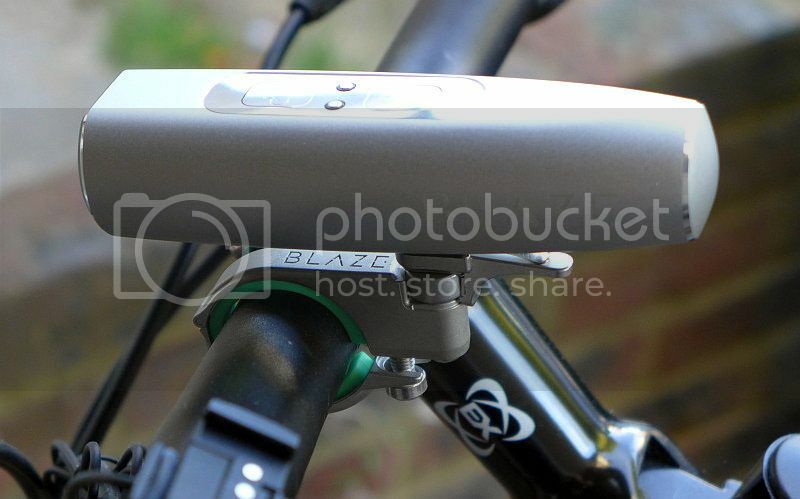 The Laserlight’s mount is slim and easy to find space for, even on an already busy handlebar. The overall look and feel is of a high-end device. All the adjustments you need are available from the two Allen bolts (one for the clamp and one for the yaw adjustment. No mistaking the laser warning labels, but as described in the user interface section, accidental activation of the laser is extremely unlikely. The fact it will simply not come on unless connected to the mount makes it as safe as it can be. 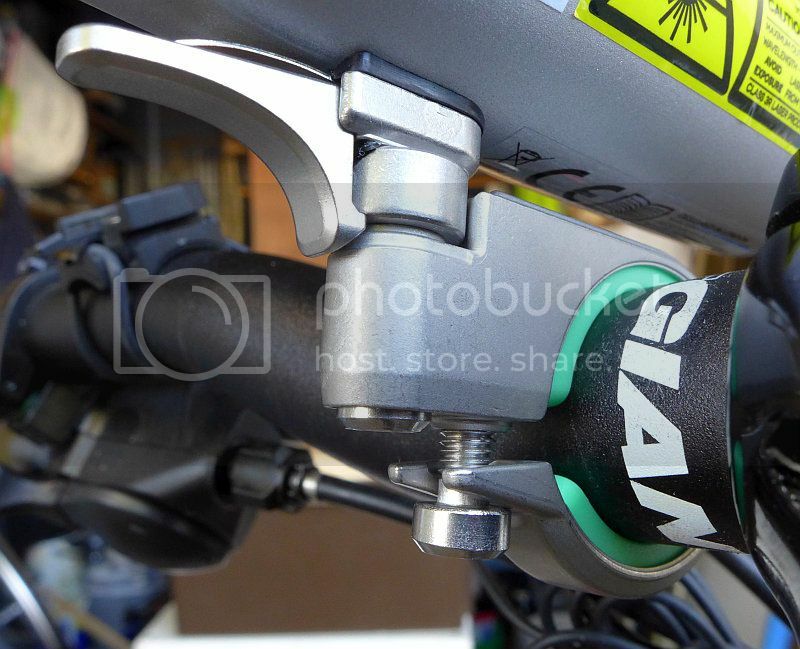 The mount release lever is small but has proven perfectly reliable and secure. 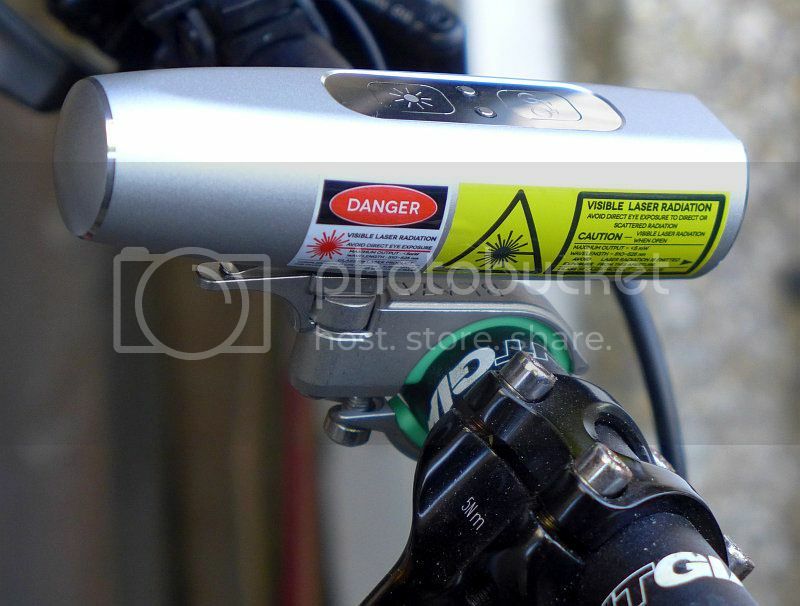 The Laserlight needs to be aimed down to put the laser image of the bike at the correct distance in front of the rider. 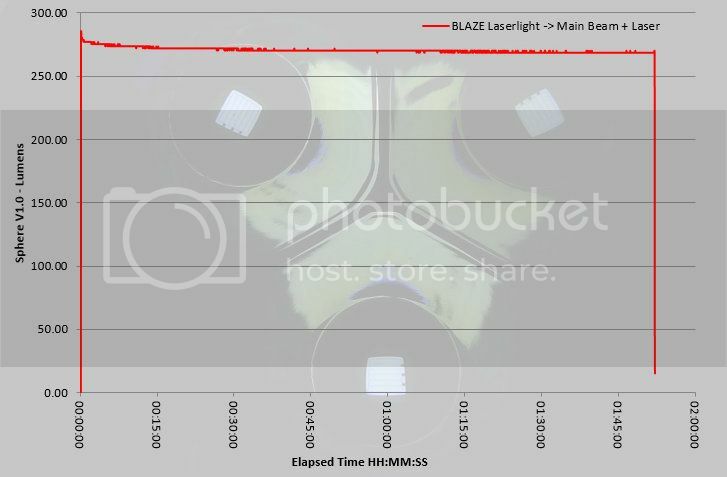 This photo shows the approximate angle you will find the Laserlight ends up when properly adjusted. 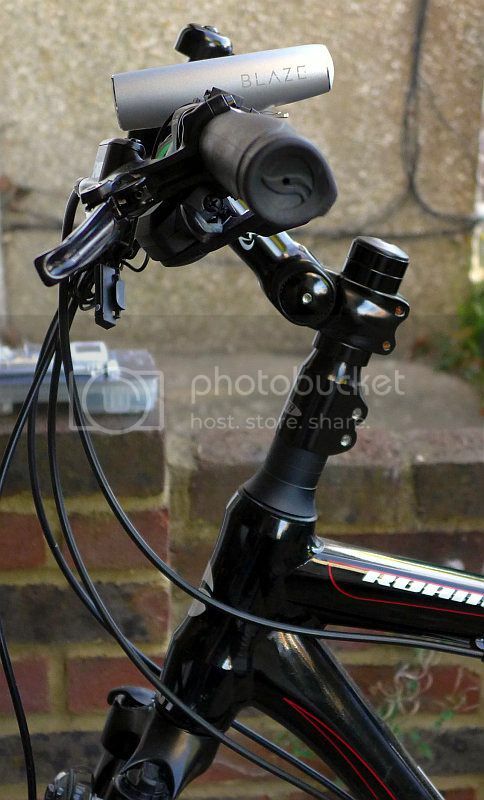 (the angle shown here is more than most will require, but you can also see I have a stem extender and adjustable stem which increases the handlebar height). 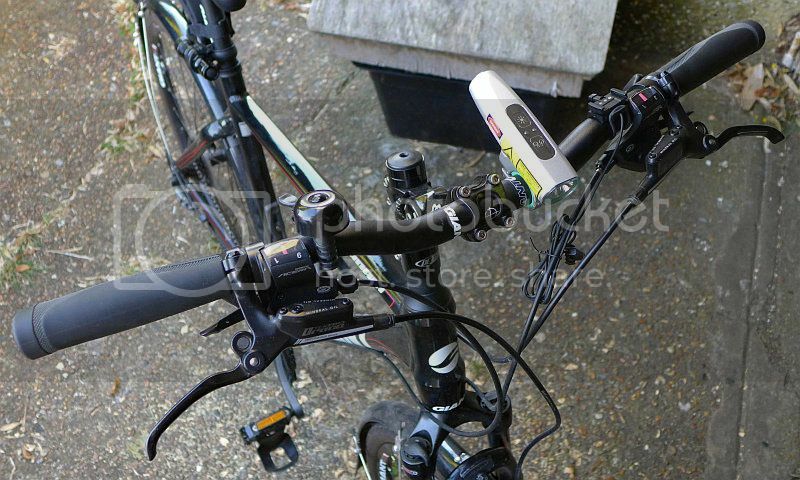 A very neat package, the Laserlight is only a small addition to the handlebars. When using the Laserlight for the first few times, I did find the laser image of the bike very distracting and it was drawing my eye to the image rather than to the hazards. I would suggest first using it in quieter areas. Once it was no longer a novelty and I was able to ignore the projected image, I started to see other road users and pedestrians ‘noticing’ the image. It was as if I had a high-vis vest floating along in front of me. This rings true of the Laserlight’s real function, it is a light to be seen by. Having taken the Laserlight on both lit roads and unlit trails, its strength is definitely in making you much more visible, however the High beam is strong enough to use at moderate speeds in unlit areas. 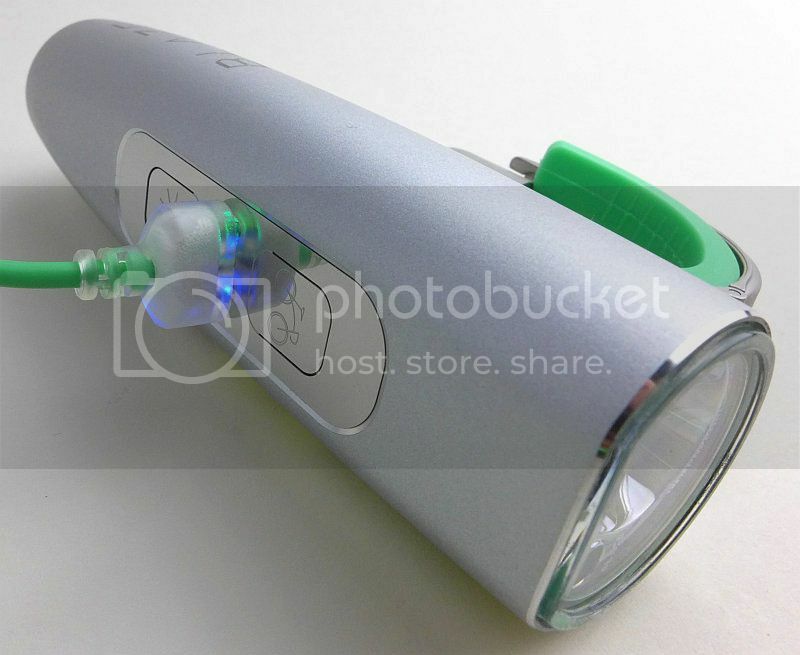 Being self-contained and using USB charging makes the Laserlight very convenient. 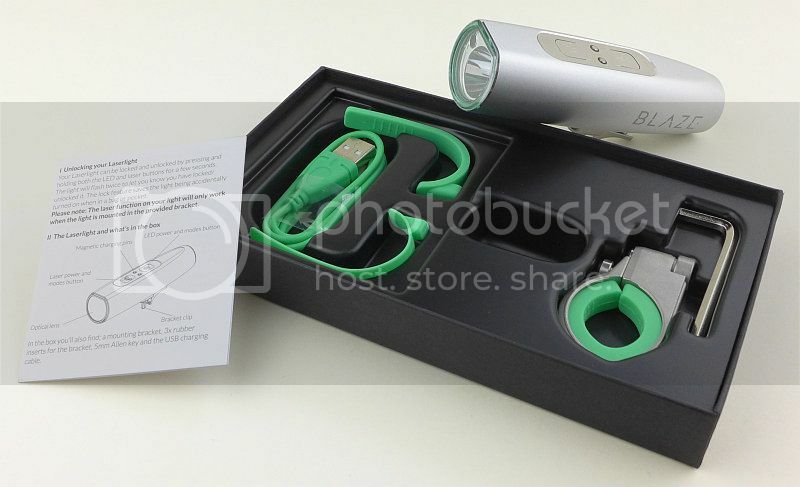 For urban commuters this will work really well, as you can top up the Laserlight on your phone charger or computer. I have found the magnetic charger connection to be a little unreliable and often needs a tweak to get it working correctly. For riders with more challenging requirements (more light needed or longer rides) this won’t work so well as if you run out of power on your ride you can’t change the battery, and the 1300mAh cell is not a great deal. What is impressive is that the Laserlight manages nearly two hours on high with this limited cell. As a new and unfamiliar concept I have a few reservations about the Laserlight. 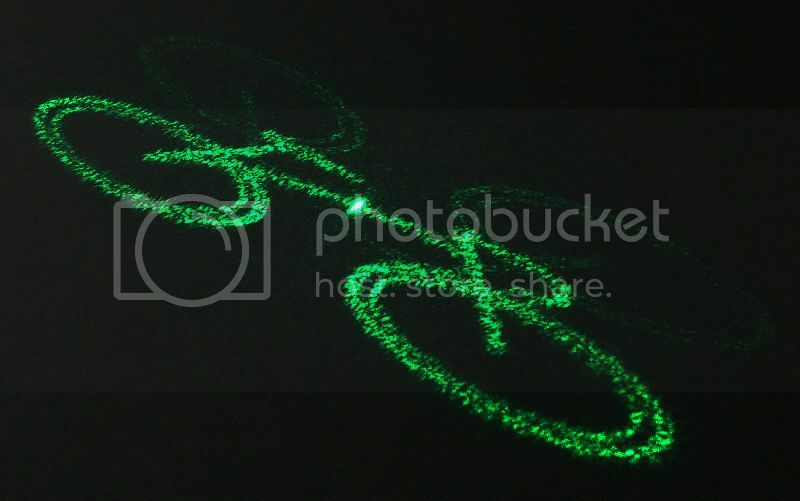 My own observations are that although the Laserlight does get noticed, the connection between the dancing green image of a bike and the following cyclist is not always made. There is a distracting effect where the green laser image takes on its own presence. The laser image does extend the visual presence of the rider and once more accepted as part of the cyclist’s recognised safety tools, I think will work very well. 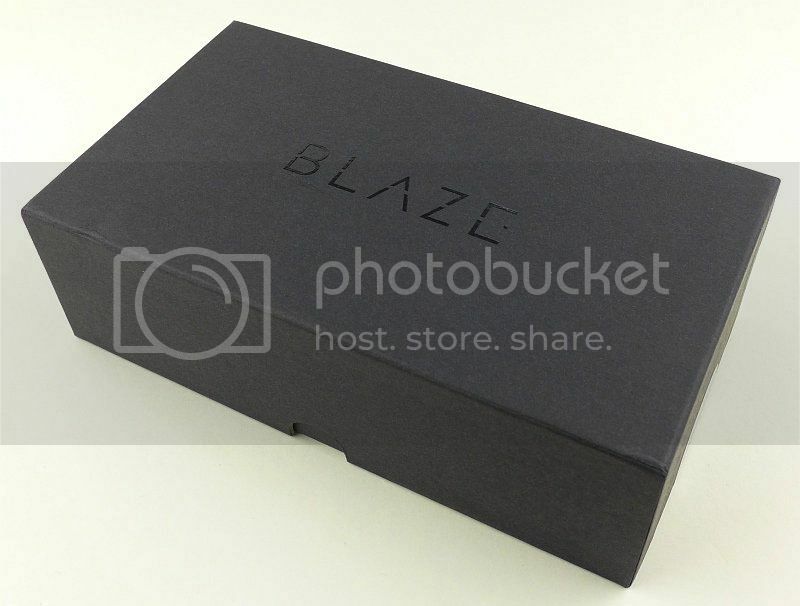 Having been aware of BLAZE since they were a startup, my observations during use fit with my original expectations. 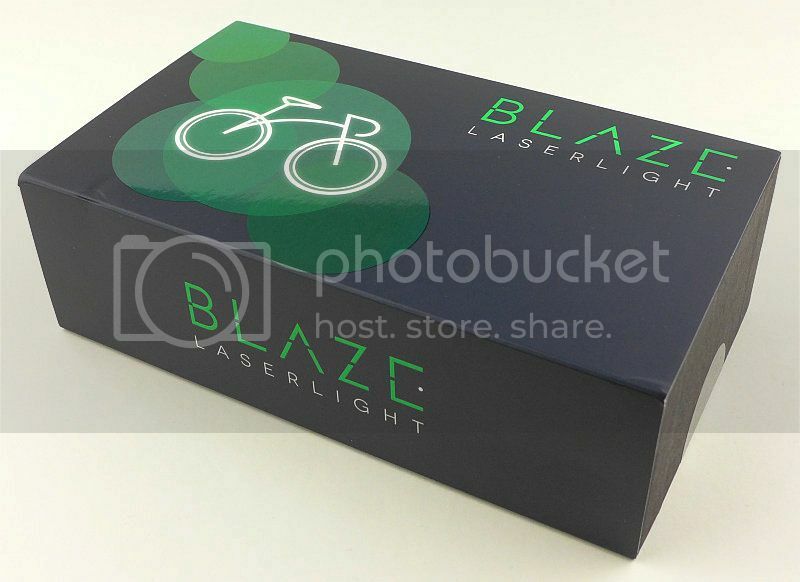 BLAZE are becoming more and more recognisable and as the product becomes better known and seen more regularly its benefits are growing too. Proof of this growing recognition is that recently a number of the London ‘Boris Bikes’ (Santander Bikes) have been fitted out with the Laserlight. Like Satellite Navigation, I would say that the Laserlight is something to help you, but not something to rely on….you still need to keep your wits about you. to get all the latest updates and news.